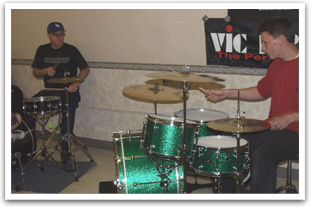 Steve discussed grooving and feel as they apply to pop music, and showed how to improve the spacing and volume of your notes so that your drumming sits “in the pocket” no matter what style, tempo, or feel you play. Steve also brought up guests to demonstrate his teaching abilities. Steve Bowman’s time with Counting Crows resulted in performances on Saturday Night Live and Late Night with David Letterman, two grammy nominations, and the opening slot on a Rolling Stones tour. Since then he has played drums with Third Eye Blind, John Wesley Harding, Tremolo, and others. His playing can be heard in movies (“How To Lose A Guy in 10 Days”, “13 Going On 30”, “How To Deal”…) and T.V. shows (“Laguna Beach”, “Pimp My Ride”, “Alias”, “The O.C.”…). 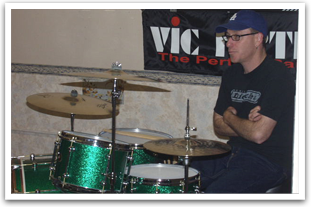 In addition to session work, Steve plays with Luce, The Bittersweets, and is the author of a new book of drum instruction called “Groove Control”.